A game of backyard cricket brings the whole neighbourhood together, and no one loves the game more than Arlo the dog. He's the fastest fielder there is, but there's one big problem - he never gives back the ball! 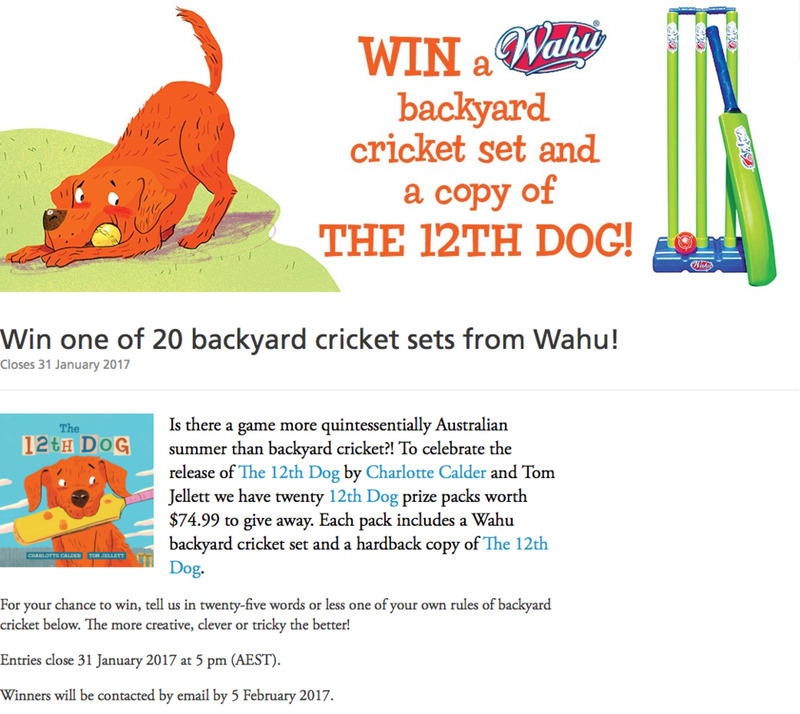 The 12th Dog captures the joy of backyard cricket and the hilarity of owning a dog. And congrats to our Arlo - the 4 legged inspiration for the book! A night of fun, celebration, dancing and general hilarity until all hours! Harry Lane performed his wonderful poem about our fearless leader Susanne to huge appreciation! Judged by Claire Stuckey. She told us one entrant really stood out. Young adult novel. Terry realised she had to go to see the Mahdi people . Lots of photos for Gay brought back. Etihad flew 300 kg donated books for free. Local refugees love the book. All donated money goes to South Sudan. We were treated to a highly entertaining puppet show duet by Christina and Claire. The manuscript was first shown to Claire at the last SCBWI conference!! Christina designed the cover first as part of 52 Week Illustrating Challenge. Christina gave a highly entertaining reading of her book. Deb Abela then made the thanks and presentations to Susanne Gervay, Regional Adviser Australia New Zealand. Deb reiterated that Susanne’s the reason we’re all here – she’s organised the amazing fruits of SCBWI. A massive contribution! A very special card, made by Christina Booth and signed by everyone was given to Susanne. Plus a box of wonderful care essentials eg a ‘No!’ paddle to say no to requests because she’s hopeless at it! Plus slippers, sleep mask, relaxing candle, do not disturb sign, writing notebook etc. Also a beautiful charm bracelet to remind her of all her lovely books. And a pendant with a quote from Elephants Have Wings inside of it. AND an amazing book engraved with a superb illustration of The Hughenden in the front, signed (and sometimes illustrated) by everyone. Susanne said that our SCBWI is one of the special writing communities of the world. Evening rounded out by a rousing group singalong – a special song for Susanne song to the tune of Rawhide! Then we danced the night away to the sound ofthe fabulous Beatknickers, SCBWI’s own band. Thanks to a couple of intrepid ring-ins! A highly informative and entertaining expose of how to create your public image and turn yourself into an icon. Think outside of box – what does the book relate to? Social media - FB, Snapchat, Instagram – inspires brand love – DYI or get help if you find it challenging. Get over your hesitancy and cringe re building brand – the feeling that you ‘have tickets on yourself’. Don’t think of it as promoting yourself – it’s all about making a connection with your readers, or potential readers. Making genuine connections rather than promoting yourself. You need to go all in, not half arsed! Embrace it all. Very easily done in not a lot of time. Open yourself up to it – reach potentially millions readers for free. Keep making connections after your initial publicity period. Pick the one or two social media channels you enjoy and can do yourself. Can seem daunting, but follow a step by step formula. It actually works. One hour every weekend is enough to set your foundations. Let people see YOU and what makes you unique. Find your niche, and branding will take care of itself. Created Writers Unleashed Festival, a space where authors and illustrators can make lasting connections. Book sales, signings and craft activities. Making it easy for new creators, and teachers and teacher librarians. Creators paid fairly but kept busy. Networking opportunities. They love to help book creators. ‘Lots of hats’ ‘Too many balls in the air’ – writing, publishing and doing PHD, plus a lot of chairing! She’s written more than 60 books, including for adults. She did a lot of reading before she was published, did articles, stories in School Magazine. She also interviewed people whose work she admired. All quite instinctive. Iconic brand. She reiterated Margaret’s points for branding success. She makes the selections from publisher submissions every month. Audience is schools – time poor and understaffed. Helps them with expert literature selection. Teacher notes are supplied. Consistency – chooses style and quality of book suitable for CBCA awards. Uniqueness – 95% of books are Australian. This is their difference to their competitors. Small team – very approachable. They source books that are difficult to access – their brand is competitive and personable. Margaret Hamilton then spoke about Pinerolo Cottage, herchildren’s book cottage in Blackheath where she runs picture book courses among other things; promoting illustrators primarily. She’s always made her presence felt and has worked extremely hard. (Once had a board meeting in hospital room!) She carried this philosophy through when she started her own company. Went to Bologna every year. And finally she’s a published author! Never had the guts to send in a manuscript before. Margrete Lamond at Little Hare got back to her with a yes 5 mins later!! B is For Bedtime has gone ballistic – 60000 copies in US. Second book to be launched in May. Authors and illustrators should follow the same principles for branding . Great social media platform for illustrators is Instagram. Judith Rossell a great example of this. She never ‘sells’ as such – she simply makes great personality connections. Stylefile incredibly helpful to illustrators, and an honour to be selected. Lesley Vamos works Facebook really well. Character branding vs author branding – which one to pursue? Depends. For example, Liz Pichon presents as character Tom Gates rather than herself. Her character’s brand in other words. Sophie Masson did romantic fiction for YA under diff name – all the characters had social media presences – one had blog, one had YouTube etc. Extended the life of the characters. But you have to think about it carefully. Can be quite spooky! Belinda was asked whether she thinks about gender diversity, cultural diversity etc. Yes, she likes to support new authors and publishers as well. But limited by what’s being published that month. Books for boys and girls. Relies on publishers to have the right agenda. Margaret – Kids’ books now 32% of sales as distinct from 25% a few years ago – they should have equal review space. She mentioned her next course at Pinerolo this coming Saturday on creating kids’ books with Freya Blackwood – see website. Phew – a very full session! !